"We must affirm that we are already that which we hope to be and live as though we were, knowing that our assumption, though false to the outer world, if persisted in, will harden into fact." I have heard people say that affirmations do not work. We are using affirmations every day whether we realize it or not, and they are always working. Every time we say "I am..." such as "I am unlucky, I am broke, I am overweight, I am sick, I am lonely, I am sad, I am always running late, I am a failure", etc., we are affirming to the Universe and ourselves, exactly what we are and the Universe just sends us more of the same to confirm it. There is the argument that those affirmations are things we accept as true about ourselves, and therefore that's why they work, and I agree. Whereas positive affirmations such as "I am lucky, I am successful, I am healthy, I am happy", may not be true and that's why they don't work. In other words, we must be able to affirm as true, what we desire, in order for it to become true, for us. "That which we will not affirm as true of ourselves cannot develop in our life"
Here's a little process I use when an affirmation brings up doubt or resistance, to create affirmations that I can accept as true for me. Whatever affirmation I am going to begin using, if I affirm it and it brings up resistance, or it doesn't feel good, I ask myself am I willing to be that? Am I willing to be what I am affirming as true? Am I willing to imagine myself in the end result, already being, doing, or having what I desire? If not, then why not? This helps me become aware of negative beliefs attached to my desire that may be holding me back and work through them. This also helps me create a new concept of myself, of being what I desire to be because it is our concept of ourselves, what we decide is true for us, that determines our present and our future. Then I start with the affirmation..."I am willing to be..." and that feels good. Meanwhile I am spending time each day imagining the end result, assuming the feeling of the wish fulfilled, imagining myself already being, doing, and having accomplished whatever I desire and that makes it easy to affirm it. Imagination creates reality, and if you've imagined it, you've gotten the concept of yourself being it, so speak it forth with confidence, "I am ..." . Increase your luck, with affirmations. P.P. 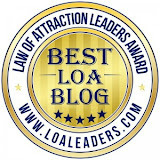 S. Got a great manifesting story you'd love to share? I'd love to hear it. Or, if you'd like a Free 30 minute Law of Attraction coaching session to begin deliberately creating your lucky life, just send me an email. I'm a true believer in the power of scripting when it comes to manifesting my lucky life. I've written before about what a great tool scripting is but I recently had more evidence of the true power of this great manifesting process. Scripting is like placing your order with the Universe. For those of you who have never used scripting, here is how I define scripting. Scripting is when you write out what it is you want to happen, how you want it to look, and especially how you want to feel, or expect to feel, before it happens, as if it has already happened. I was rearranging my books the other day when a paper fell out of one, and I stopped to read it. It was two separate events that I had scripted in 2014. I had scripted both events in detail. What actions I had taken, then end results that I wanted, and how good that felt, and I gave thanks. Both events, had turned out exactly as I had scripted them, in every detail. Amazing, right? Here's what really amazed me. Both of these events were an annual occurrence and were set to happen again in 2015, and they did. Only this year, (2015), even though I scripted them, I didn't have time to write out in detail, all of the details. I didn't take time to write out all the actions I had taken. All I had scripted were the end results that I wanted, and how wonderful that felt, and I gave thanks. No juicy details. Just the end result. I got exactly what I wanted, it happened much faster, easier, and in a way I would not have imagined, and I hardly took any action at all. This made me realize, we are so powerful as deliberate creators, we can script in all the details, the efforting, the action steps, the people, in other words, all the how's that we think we need, when in fact, all we need to script is the end result desired, as if it has already happened. Let the Universe figure out the how's. Obviously the Universe can deliver it faster, easier, and in ways we can't even think of. Here's my tip for Increasing your manifesting luck - Skip the details, go straight to the end result whether it's imagining or scripting. I thought it was time for another one of my magical manifestation stories. I just love the way the Universe can deliver when we clearly state something we desire, and promptly release all attachment to it. Don't you? One Sunday night, my Sweetie and I were watching the Harrison Ford “Fugitive” movie. Since the movie takes place in Chicago, I look over and ask Sweetie, “How long has it been since you’ve been to Chicago?” His reply was “Years”. I agreed it had been quite a few years since I had been there also, so I suggested we plan us a little trip there together. He agreed. We continued watching the movie without further ado. The next day on our way home from the shop, we decide to stop by Goodwill and take a look around, see if anything caught our eye. As we were wandering through the aisles Steely Dan’s “Hey Nineteen”, began to play on their sound system. Sweetie and I are big Steely Dan fans so we were enjoying their choice of music. 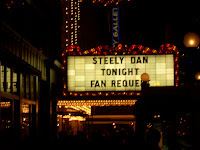 Sweetie made a comment that it sure would be fun to go see Steely Dan again soon. I agreed. About that time, Sweetie’s phone rings and it’s a friend we had met several years ago who shares our love of great concerts and his first question was, “What are you guys doing Labor Day weekend?” No plans at the moment, Sweetie replied. Wow, how amazing is that? Two weeks later our friend calls again to see if we are attending a certain concert, (Heaven and Hell) the next day in Cincinnati. If we were, he would meet up with us there (he lives 200 miles from us), and give us the Steely Dan tickets. We hadn’t even known the Heaven and Hell concert was even happening but said if we could get some tickets for it, we would be there. Sounds like fun. I go to Ticketmaster to see if any tickets are available and miraculously bought two, second row center, pit tickets for cover price. Wow, that was lucky. The next day we drive the 150 miles to the show and meet up with our friend. He tells us about winning seventh row tickets to see Steely Dan at the Chicago Theatre five nights in a row. Since he already had tickets for the Friday night show and wanted to sit with some other friends, he was happy to give these tickets to us if we promised to go. Chicago is about a 500 mile drive for us. We promised we would be there. As he walked away, Sweetie turns to me and asks, “How are we going to afford a trip to Chicago so soon? We need money for gas, the hotel, and food.” I told him not to worry, we would go, somehow, some way. At that moment a guy walks by and the back of his t-shirt said KEEP THE FAITH. I told Sweetie, “Look, it’s a sign!” “No, he replied, it’s just a Judas Priest concert shirt.” I repeated, “It’s a sign!” I was going to keep the faith. The Heaven and Hell concert was lots of fun, our seats were awesome and Sweetie even got a Tony Iommi guitar pic. The next day I was back at the shop, selling my comics, when I got an excited call from my daughter. Seems the mailman had just delivered a priority envelope for me. Inside was notification that I had just won a $500 American Express gift card, which was enclosed. That card paid for the entire trip and we even stayed at the Wit Hotel, just around the corner from the Chicago Theatre. The Wit had some delicious cookies, we had an awesome meal at an Irish pub, we went down to the Field Museum, and took in some sights. What a fun weekend in the Windy City! That Steely Dan concert was one of the best we have attended so far, and as a bonus, had a special guest appearance by Larry Carlton playing guitar. Whenever I know what I want, keep the faith, and trust the Universe to figure out the 'hows', it's always amazing.